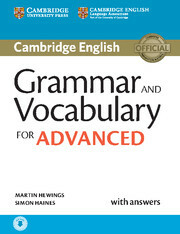 Cambridge Grammar and Vocabulary for Advanced provides complete coverage of the grammar and vocabulary needed for the revised exams, and develops listening skills at the same time. It provides students with practice of exam tasks from the Reading and Use of English, Writing and Listening papers and contains helpful grammar explanations and glossary. It also includes useful tips on how to approach exam tasks and learn vocabulary. It is informed by the Cambridge Learner Corpus to ensure that the language tackles real learner errors. The accompanying listening material is available online for download. Presents grammar through audio material which helps improve listening skills and provides a context making the language more memorable and meaningful for students. 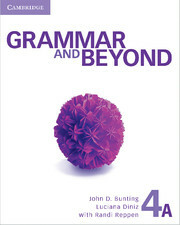 Contains clear and reliable grammar explanations with lots of examples. Ideal for learning new grammar points or as a reference. Practises a range of exam tasks thus providing exam preparation at the same time. Provides model answers for Writing tasks giving students good examples of language use and structure. Mapped to the Cambridge English: Advanced (CAE) exam with coverage of all papers so that students immediately see the relevance of the vocabulary work to the exam papers they sit. Informed by the Cambridge English Corpus, including the Cambridge Learner Corpus to ensure that vocabulary is presented in genuine contexts, and covers the errors that students really make. Includes 'Exam tips' on how to approach exam tasks. 'Vocabulary notes' allow students to build their study skills and provide additional information on the vocabulary related to the topic. Topic-based approach means that material can easily be used to supplement an exam coursebook. Key word lists, including collocations, phrasal verbs, etc. is a useful checklist and revision resource for students.